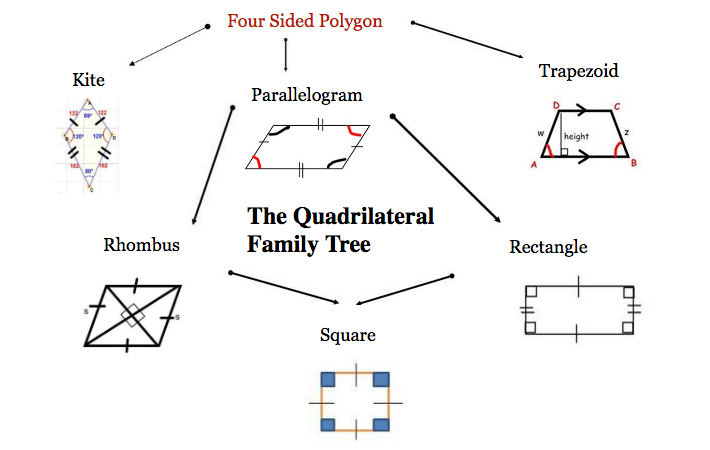 Let me introduce you to the quadrilateral friends and family. A four-sided family that lives on Geometry road. There are three main members of the family, kite, trapezoid, and parallelogram. Like any family group they look and act similarly, but are also very different. Kite had two consecutive pairs of sides the same, but her opposite sides were not equal. Her diagonals were as well unequal. She enjoyed putting on fabric and flying high in the sky. Trapezoid had one pair of parallel sides, and nice supplementary legs. Although trapezoid was friendly, family and friends could never figure out accurately what defined her. Parallelogram, with her two units of parallel sides, was extremely popular and was the first family member to marry. She eventually had two two little shapes, rhombus, and rectangle. Rectangle was like his mother form, several parallel sides, and several 90-degree angles. Rhombus was an excellent son with equivalent sides, two pairs of parallel sides, and equal opposite angles. Mom was proud of the stunning shapes of her two kids. One afternoon rectangle and rhombus told mother they wanted a new family pet shape. Rectangle desired a three-sided family pet, rhombus wished a five-sided pet shape. Mom said, “I really know what to do, I will be right back." When she returned she had the brand new pet form. “meet square” she said. "He is the best, two parallel sides, equal sides, and four 90 degree angles." Rhombus and Rectangle agreed he was the perfect pet polygon and adored their new family pet shape.